Another Sunday means another late NY Giants collapse and another defeat. We are now 0-5. Yup, apparently it’s that kind of year. I’m not even talking about making it to the play-offs; after losing to the Carolina Panthers 38-0 in the third game, I’ve pretty much given up that hope. What I’m talking about is stop watching the NFL altogether this season. I mean, when your team is breaking records for being the worst team on the league (such as giving up 182 points, the most allowed by a team in five games since 1961) you’re disappointed, discouraged, even outraged. You can’t fathom how a team who hoisted the Lombardi trophy just two years ago is now the laughing stock of the NFL. But there you have it. NY Giants are 0-5. On top of that there’s no more Breaking Bad...arghhh...my Sunday nights just went from bad to worst. Last night I was so bummed I decided I deserved a treat, something I could whip up in a heartbeat (and possibly paleo-friendly). 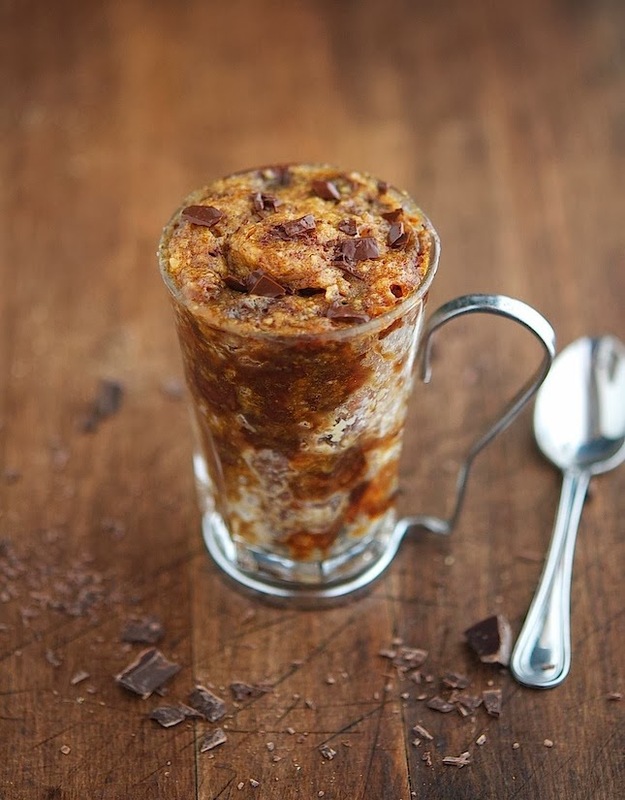 That’s how I came up with this 1-Minute Paleo Chocolate Chip Cookie (in a mug). I’ve seen the microwave cookie in a mug thing all over Pinterest and Foodgawker for quite some time already. At first, I was very skeptical about it; primarily because I’m not a big fan of microwave baking. In my (small-minded) baking world, the oven is the one and only place where baking happens. And only mushy baked goods can come out of a microwave. Not for the first time, I was proved wrong. Thanks to my baking frenemy (aka the microwave) I had a paleo-friendly chewy chocolate chip cookie in under a minute. Chances are, you already have all the ingredients in your pantry to make this; so there’s no excuse not to try it. However, as a healthy-eating advocate (totally self-entitled btw) I must warn you, this is a sweet binge and should be treated as such. The fact that it’s grain-free, gluten-free, paleo-friendly, easy to make and damn good, doesn’t allow you to indulge. Got it? 1-Minute Paleo Choc Chip Cookie (In A Mug) Print this recipe! Important. Use the same mug for the entire baking. I used an espresso cup which was about ¾ full before cooking. The dough rises so make sure you don’t fill it to the brim. 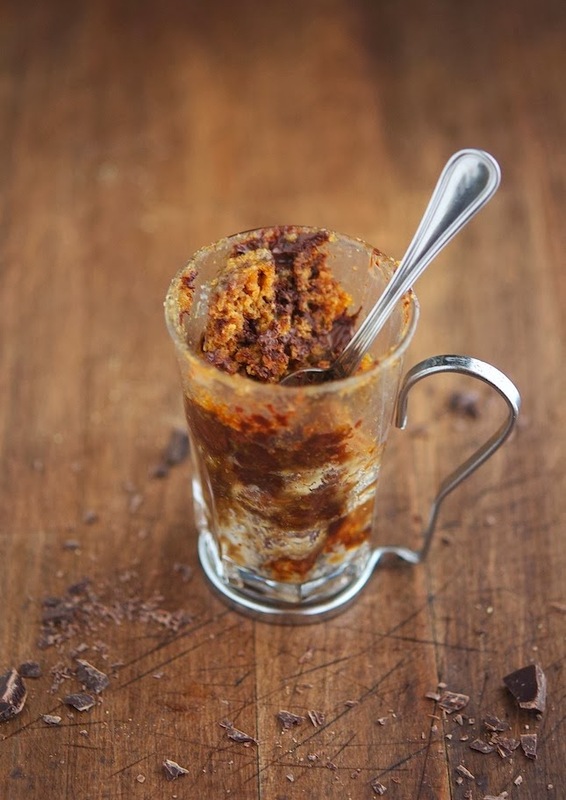 Alternatively you can use a ramekin, coffee cup or any small dish. Also, you have the option of using either raw coconut palm sugar or honey; however the former yields much better results in texture and taste than the latter (less sweet and richer flavor). In a mug melt the coconut oil in the microwave for 10 to 15 seconds — until just melted, not boiling. Add raw coconut palm sugar, vanilla extract and salt and mix well until combined. Add the egg yolk and mix until no traces of the yolk is seen. Mix in the almond meal and then fold in the dark chocolate chunks. Cook in the microwave for about 40 to 50 seconds in the microwave. Don’t overcook it, the cookie starts drying and tastes awful. Like regular cookies this one will continue to cook as it cools. Bear in mind that the aroma will bring all the girls (and/or boys) to your yard, so be ready to bake more cookies. One serving yields 265 calories, 17.75 grams of fat, 19 grams of carbs and 5 grams of protein. I share your skepticism of microwave baking, but in this case it won me over! Haha, ok so I made this on the stove in a pot because I don't use a microwave and it was just runny but still tasted awesome except that the honey I have is very sweet so now I have a sugar overload headache haha! Would love to try this in the microwave but don't like using them. Hahaha you cracked me up! How did you cook it in the microwave? Your cup has metal on it? I am confused? Although it does look good. Really good question. I'd like to know too. It's a glass cappuccino cup with stainless steel handle. The handle separates from the glass for easy washing (or in my case microwave baking.) Cool right? I think I bought them at Sur La Table, but it might have been Williams-Sonoma. You can find them on Amazon, just look for Bormioli Rocco Cappuccino Cup with Stainless Steel Handle. Aw, you poor thing! I so feel you pain. My teen loves his mug cakes, but never seen a mug cookie. Will try it out. 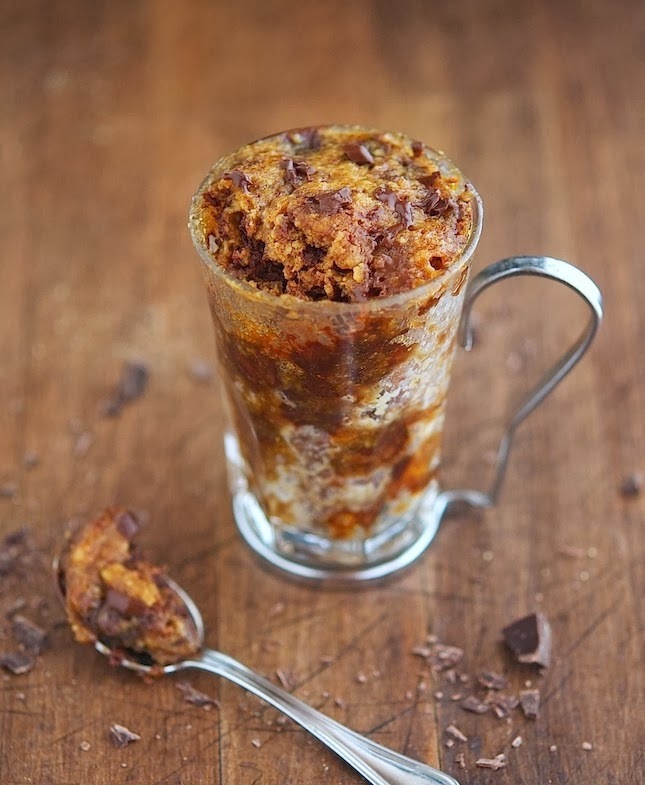 This mug cake sounds fantastic, a dream come true as its so healthy! And it looks ridiculously delicious! But, I don't know bout this sharing thing!!! What about substituting stevia for the honey? I have need... I will try! Thanks! Yum just made this. Absolutely divine, but definitely only enough for one!! Just made this, my husband LOVED it! Definitely helps with sweet cravings. Thank you! So you cook it in one mug and you are supposed to share it??? Oh boy...haha. I'm not too sure if that will happen at my house. This was delish! 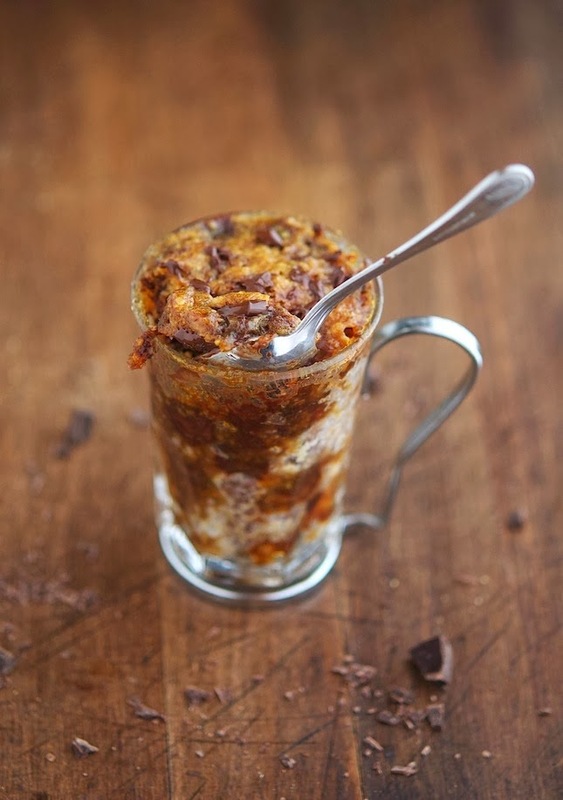 I keep searching for the perfect paleo mug cake and so far this is my fav! I just made this! Usually I hate microwaved baked goods.. they're always too spongy, but I cooked this for 50 seconds and it was perfect. Tasted delicious and would be good with some banana paleo ice cream. I used almond meal, but I wonder what coconut flour would taste like? it tastes great! i have a question though, it was my first mug cake and it came out different from what i expected... i thought it would be fluffy and cover most of the mug, but when i took it out of them microwave it was only about half an inch thick... did i do something wrong? i did taste delicious though! Hey Mike! I stumbled on your recipe today from Pinterest. I don't own a microwave. Any thoughts for this recipe on a stove top or in the oven? I have 5-oz porcelain ramekins from Sur La Table for oven baking. Thanks! Made so many version of paleo mug cake, this has been the absolute best TASTING recipe I've ever tried. Instead of almond flour, I used coconut flour and a lil more vanilla extract. It wasn't as moist (still crumbly texture when finished) but was DELICIOUS!! I've recently started a 21 day sugar detox...has anyone tried making this recipe without the palm sugar or honey? If so, how did it turn out? I haven't tried with this recipe, but I would think subbing some mashed banana/applesauce for the oil would sweeten the cookie up. I've tried recipes with no sugar that use fruit instead (as a sugar and oil sub in one). A bit confused: You say it serves 2, the nutritional info is based on 1 serving. So, we should double that nutritional info if we consume the whole thing-right? Wow! This was worth every calorie! I've never made a microwave 'baked' dessert before & boy am I glad this was my first try at it! Deeee-licious. I had a sweet-tooth that needed to be satisfied but didn't want to make a whole batch of cookies to tempt me throughout the week. This was the perfect solution, thanks so much! LOVED IT & will definitely make again! Just made it - eating it now! Just perfect.